As soon as I saw the Rhubarb Frangipane Tart that Dom had made at Belleau Kitchen as his entry for Dish of the Month (Cooking Nigel Slater recipes) I knew I had to make it. These are the first stalks of rhubarb I have pulled in my garden. 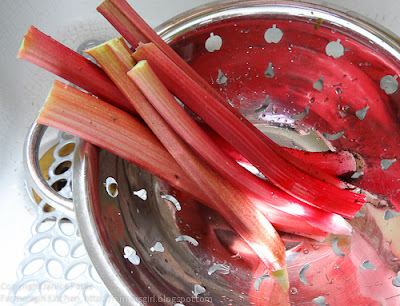 It was slow to start this year as it's been really cold, but as soon as it started to rain and warmed up slightly, the rhubarb just burst through and now it's gone slightly mad! 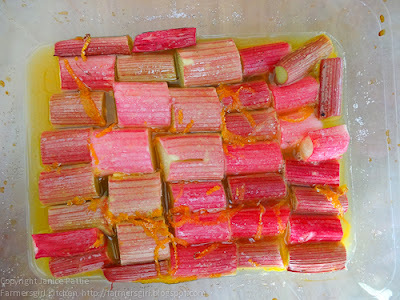 Dom poached his rhubarb in red wine, but I decide to do mine in orange juice with the zest of the orange too. Here is the rhubarb after it had been poached, I slightly under poached it as it has to go back into the oven on top of the frangipane. 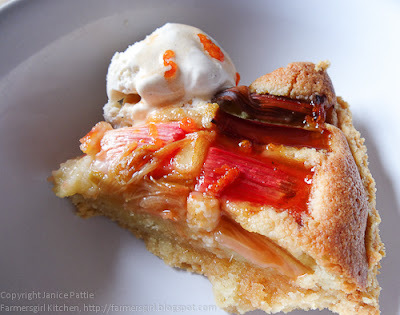 I served the tart with Madagasgar Vanilla Icecream and the juices from the poached rhubarb reduced and poured over the tart. As I bookmarked this recipe from Belleau Kitchen I am entering it for Bookmarked Recipes hosted by Jac at Tinned Tomatoes. This is awesome! This tart looks so mouthwatering. Would love to make one at home. Thanks for sharing its with us. 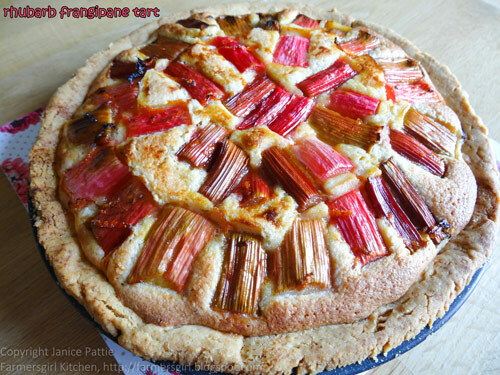 Good Morning Janice, I love frangipane and I love rhubarb, so this is a perfect little tart for me... well, not so little! I will enjoy baking it. I have enjoyed my visit and I have become a new follower. I would like to invite you to visit me at Ivy, Phyllis and Me! I think there are a couple of recipes you might enjoy. Wow that looks delicious Janice - really juicy and sumptuous. 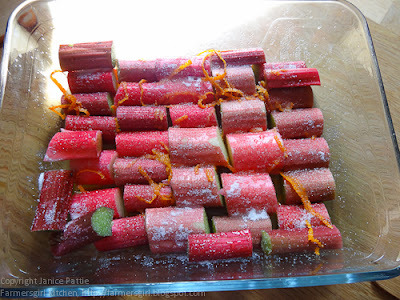 What a great use of your rhubarb. Looks really Yum. I was searching for kitchens idea but your post stops me here :0 this is an fantastic blog love it. Thanks.